Post-impact Tertiary and Quaternary sediments are widespread in the basin, and, therefore, outcrops exposing impact features are very rare. 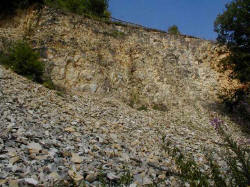 In the abandoned Burgstall quarry at the basin rim, excavated rocks are exposed to form a breccia composed of large blocks partly displaying mortar texture and grit (gries) brecciation. Fig. 1. Burgstall abandoned quarry. Fig. 2. 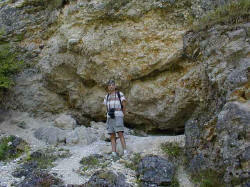 Limestone breccia, Burgstall. Fig. 3. 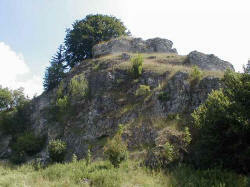 Part of the Galgenberg (“gallows hill“) uplifted megablock of Malmian limestones in the eastern basin. Fig. 4. 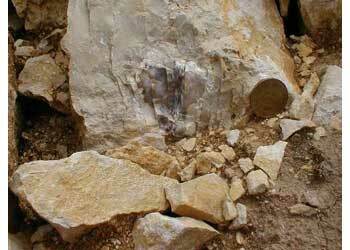 Subparallel open fractures in a chert nodule, Malmian limestone in the Galgenberg megablock. The fracture strike points to the center of the structure. Coin diameter 22 mm. 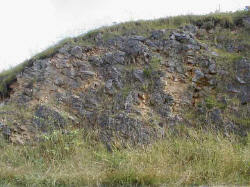 For comparison see the shock-induced subparallel fracturing in Buntsandstein quartzite cobbles, Rubielos de la Cérida impact structure (Spain). Fig. 5. Strongly deformed and fractured Malmian limestones at the NW crater rim, Hirschtal.